Not only does mulch add a decorative finish to your flower beds, it also keeps the soil cool and moist and thus reduces the need for watering. By using a pre-emergent herbicide with mulch, weed seeds are discouraged from germinating and growing. But which mulch should you use? There are several types of mulch to choose from, and each type can give your landscaping a different finishing touch. These types of mulches release acid when they break down. Pine mulches should be used around plants that need a more acidic soil. Use around azaleas, rhododendron, pieris japonica and holly. This is by far the most popular mulch. It has a dark color and knits together well so that it does not wash away. This mulch is often available in different colors, including black, red and brown. This long-lasting mulch has a pleasant fragrance. Cypress mulch also knits together well, and it is thought to repel insects. Artificial mulches may look like bark, nuggets or hardwood shreds, but they are really shredded rubber or similar materials. They are often dyed in natural tones to mimic organic mulches, but could also be dyed in outrageous colors. These mulches do not break down and will not benefit the soil, but they do not need replacing as often as organic mulches that will eventually decompose. Many gardeners use yard waste such as shredded leaves, grass clippings or pine needles as mulch. While these can be effective mulches to conserve moisture and repel weeds, and they are certainly more economical, they do not have the refined look of wood mulches. 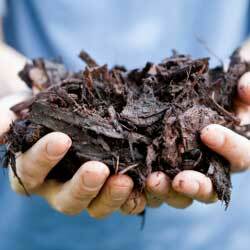 Yard waste mulches will also decay and discolor much more quickly than wood mulches. No matter which mulch you choose, it is important to use it properly. It is recommended that mulch be applied 2-3 inches deep around plants, in flowerbeds and in garden areas – less depth will not be as effective to shield and protect the soil, while deeper mulch may actually protect too much and could restrict water from entering the soil. Take care not to pile mulch directly next to stems and trunks, which could invite insects and rot to invade the plant. Over time, mulches will decay and compact, at which time they can be removed and added to a compost pile, or simply turned and worked into the soil around the plants they’ve been protecting. 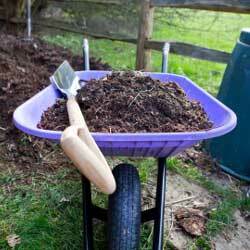 To preserve mulch a bit longer, raking and turning it over will refresh its color and reduce compaction. Not sure which mulch will be best for your plants? Our experts will be happy to help you choose!